We often hear the words “balance” and “collection” along with a variety of methods of achieving these goals for our horses. 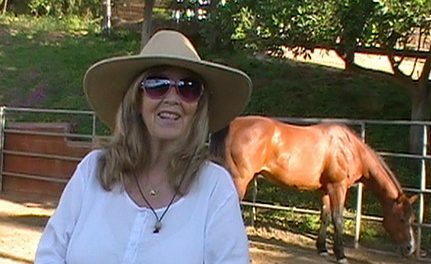 There are many different opinions on this broad subject and the short version of my mine is based on many years of experience working with many different horses in a variety of breeds. I have found that some really great trainers who I have worked with over the years share this view. We all agree that a balanced horse is a horse that carries himself. If you were to balance a horse on a scale, you would find that the front is heavier than the rear. This is true because of the weight of the neck and head. While horses are normally heavier on the front end, this can cause problems. A horse that pulls himself along on the front end is not balanced. This makes it difficult for the horse to be athletic. Even a horse with great breeding will not perform well when it is heavy on the forehand. A horse can travel in three different ways. If you watch a horse traveling in slow motion, you can see that the horse may be traveling on the front end, the angle of the horse is down in the front. If the horse is balanced, the front (withers) and the rear (hips) will be level. And, thirdly, collection is when the withers are higher than the croup of the horse. Our ultimate goal is collection with the horse coming through, or driving from the rear. 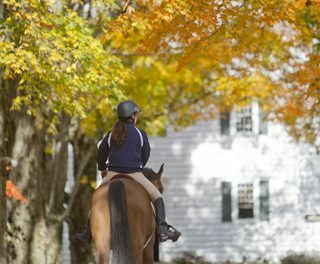 Collection requires good training, time and a well-conditioned horse. One other critical factor is of course, how the horse is ridden. With these three options for traveling, riders are also a big part of the equation; how the rider rides the horse will determine if the horse is on the front end, balanced or collected. Your horse will be one of these; there are no gray areas. Another important issue is the balance of the horse from right to left. If you are making a large circle to the left, say a forty-foot circle, and the shoulder of your horse drops or leans in, the size of the circle is reduced. The horse is not balanced. 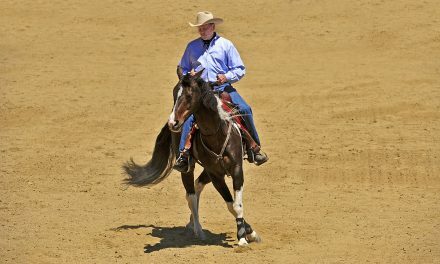 If the circle gets larger because the shoulders of your horse are bleeding out to the right, the horse is not balanced. What we want is for the shoulders to follow the size of the circle that we choose. That is a balanced horse. Finally, do not try to maintain balance or collection by “holding” up your horse. Many people want to do this but the horse needs to learn to carry himself. 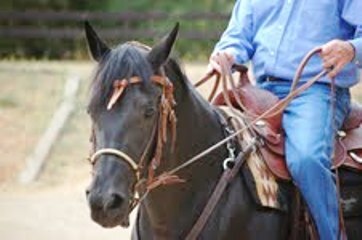 The rider needs to release the aides and learn to trust the horse, and then pick up on the aides as needed. As the horse becomes more physically conditioned he will be able to carry the position longer, for more strides. Why are balance and collection important? If the horse is on the front end, resistance is created and there is more pounding on the front legs and hooves, which can lead to lameness. A horse that is on the front end cannot perform athletically and excel in whatever discipline you ride. When a horse is balanced, it will be more willing, energetic and less resistant. Resistance itself creates an imbalanced horse. If the horse is pulling on you with the reins, it is on the front end. No horse that pulls on the reins is balanced or collected. The horse must yield to the pressure of your hands. If the horse is resisting and does not move off your leg, it is on the forehand and imbalanced. The same is true for the shoulders. If the shoulders are leaning in or bleeding out, the horse cannot be balanced, let alone, collected. It is very important to recognize when your horse is on the forehand and not balanced. It is important to teach your horse to yield to pressure from your seat, legs and hands. Once your horse is responsive to the aids, you can use exercises to help develop balance and self-carriage. To be successful, your body position must be correct and balanced. Your cues must be clear and consistent. You want to work toward having your horse respond to the lightest cures. The lighter and more obedient the horse is, the better balanced the horse will be. Then you can work on teaching the horse to be collected. Emotionally and physically the horse will be better and you will have a great ride. I hope this article helps and I wish you happy trails.